For more than 16 years I have supported individuals and couples through life transitions, including birth. Originally trained in Anthropology, I have a long interest in family and cultural systems, community and personal beliefs, traditional roles and practices, and how these support individuals through important life stages, such as birth, childhood and relationships. Fifteen years ago I shifted my attention to women’s spirituality and birthing focusing on traditional birth practices, and I worked with Aboriginal women in Queensland in order to research and understand the practice of women’s business in their community. 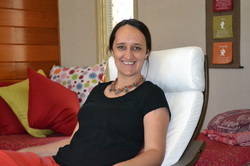 As a mother, Doula Trainer, Psychotherapist and Breathwork Practitioner I am pleased that I am able to share my passion for joyous birthing and parenting with Canberra families. I am witness to the journey of life as it unfolds gradually during pregnancy, birth and beyond. It is about being present to the needs of families and being a solid reference point for gentle guidance, support and understanding during this time. I am a companion to mothers and fathers as they navigate new or worn territory; it is a work of love and honour and deepest respect for families and their choices. Private Practice in Education and Counselling: I work in private practice supporting individuals and couples through Prenatal/Postnatal education, Relaxation/Meditation, Breathwork and holistic Family Counselling and Psychotherapy. My belief is that as a community we are all responsible for growing and supporting healthy bubs and healthy parents and I am honoured to be part of this process. My belief is that birth is an important journey for all members of the community. It is the becoming of mothers and becoming of fathers. It’s the moment of ‘I can’ and ‘I will’. It’s the first breath of one full life, whatever that path takes. It can be healing, it can be fearful or it can be with love. Birth is the emergence of the baby from the mother and the emergence of parents – of a growing community. My wish is for the safe, nurturing and loving birth of all new life; as well as the growth of safe and healthy parents in our community. Please enjoy taking the time to have a look around my website, and please contact me to discuss your needs or to make an appointment. Calmbirth Training (Practitioner 2005 - 2013).